Windows 7 users who ran Windows XP PCs previously may have noticed that Microsoft changed how file extensions are managed in the new version of Windows. Users who want to assign a program to a file extension need to open the Windows Control Panel, click on Default Programs and there on associate a file type or protocol with a program. Windows XP users were able to control the behavior in detail in the Folder Options instead. Even worse, there is no option to create a new file type, edit an extension's properties or change the icon. ExtMan is a free portable program for Windows users who want to create, edit or delete file extensions in the operating system. It adds the functionality to Vista and Windows 7 but runs fine under Windows XP as well. 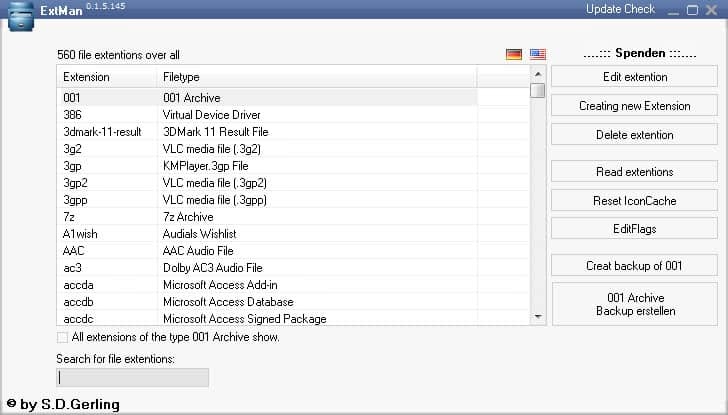 The program displays a list of all known file extensions on startup in list format. Note that you can switch the interface language between English and German by clicking on the flags in the interface. The list of extensions can be sorted by extension or file type by clicking on the column headers. Users and administrators who need to find a specific file extension can use the built-in search to filter for it. A selection menu is displayed on the right side to edit, create or delete extensions among other features. The easiest way to edit an existing extension is to double-click its row in the extension listing. 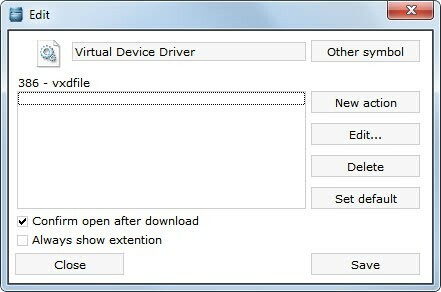 Here it is possible to change the extension icon, manage actions, configure whether the file extension should always be shown in Windows Explorer and elsewhere, and if a confirmation is required to open files with the extension after download. Actions can be created, edited or deleted. There is furthermore an option to configure a default action if multiple actions are available, e.g. opening the file in several programs that support it and selecting the default that you want loaded when you double-click on a file that has the association. Another handy feature is the ability to create a backup of a selected extension to be able to restore it at a later time. The final two options available are to reset the IconCache, which is handy if an extension icon has been modified, deleted or added, and Edit Flags to add flags to extensions. ExtMan is a handy program for Windows users who want to create, edit or delete file extensions in the operating system provided that they run Windows 8.x or older versions of Windows. Users and admins who run Windows 10 may want to check out the alternative mentioned above. Nice find. Just what I needed and didn’t have sense enough to look for. Thanks. Being interested in ExtMan, went to the site, which is German, as you stated, without a means to ‘click’ to another language for ExtMan. My search engine is Bing, which has a translation feature. Using the Bing-English-Auto-Translate-Feature of the ExtMan article, I learned the ‘download’ file is 0 bytes due to being in a ‘beta’ state since 2008. This software is not available for use -or- did I read something wrong, Martin? The size reporting is wrong. Just download the file and you can extract and use it normally. Rahul, this is a multi-language version. You need to change the language in the program. English users need to click on the US flag to change the language from German to English. A selection menu is displayed on the right side to edit, create or delete extensions among other features. The easiest way to edit an existing extension is to double-click it in the extension listing.